The historical partnership between SCM and Riva1920 continues. This year too, during the Salone del Mobile, 17 to 22 April in Milan, SCM is to sponsor the "Light Up Your Idea" Design Award, to be awarded for the fifth year to the best design of solid-wood furniture among all of those offered by participating architects and designers. By sponsoring this prestigious prize, SCM provides a concrete contribution to the development of young designers and of the entire furniture industry: An industry in which Riva 1920 is a fine example of professional excellence. 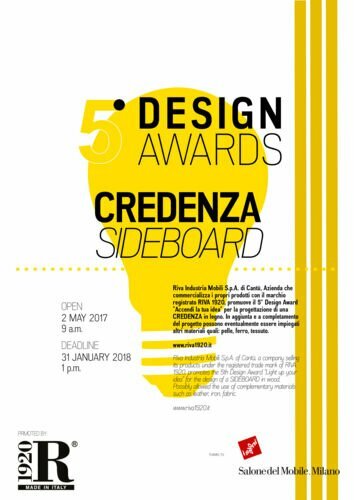 The event, to be culminated by an award ceremony on 20 April at the Riva1920 stand (Hall 6 Stand A23 - B20), calls for design ideas for a wooden dresser. Designs may also include the use of other materials such as leather, iron and fabric.